WpfMprSliceVisualizer class allows to define parameters of visualization for DICOM MPR slice in image viewer. The class allows to define colors and marker point of slice. The SDK provides 2 visual tools for visualization and transformation of DICOM MPR slice in WPF image viewer. 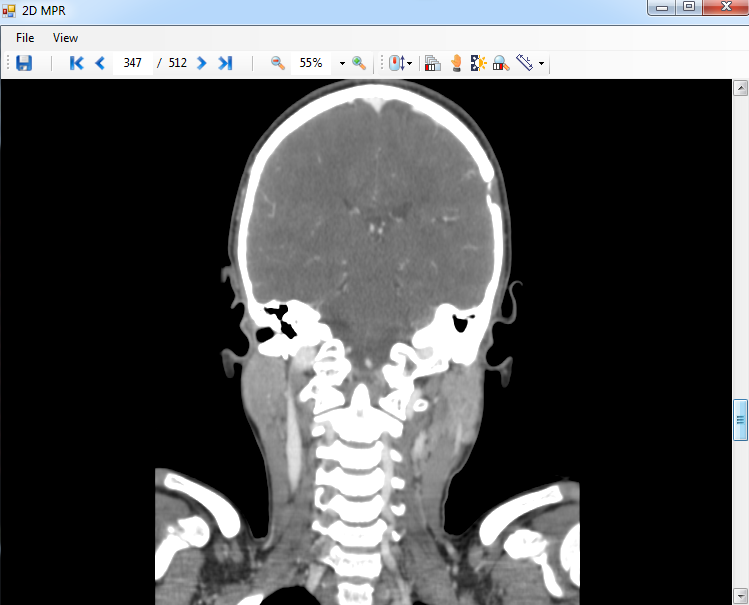 View DICOM MPR slice in image viewer. Move DICOM MPR slice along the horizontal, vertical and perpendicular axis in image viewer. 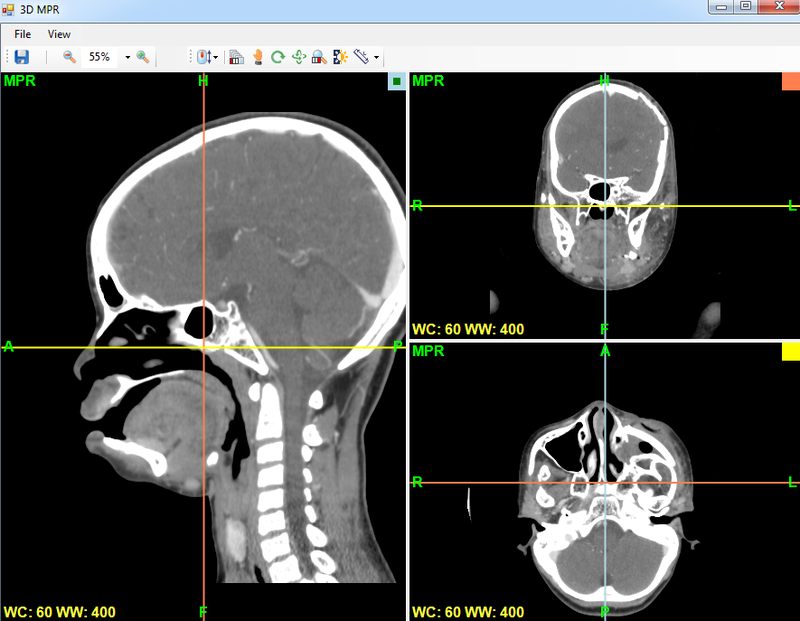 Rotate DICOM MPR slice in 2D and 3D-space in image viewer. By default, this visual tool uses the left mouse button for browsing through DICOM MPR slices (moving a DICOM MPR slice along the perpendicular axis) and uses the right mouse button for panning a DICOM MPR slice (moving a DICOM MPR slice along the horizontal and vertical axis). WpfMprImageTool.GetInteractionMode method allows to determine, which operation is assigned to the specified mouse button. WpfMprImageTool.SetInteractionMode method allows to assign an operation to a mouse button. The visual tool properties allow to define the quality of MPR slice rendering, get a focused MPR slice, etc. Also the WpfMprImageTool visual tool allows to build a new DICOM MPR slice in image viewer. The building of DICOM MPR slice can be started by calling of WpfMprImageTool.AddAndBuildSlice method. Here is an example that demonstrates how to display an axial DICOM MPR slice in image viewer.
''' Displays the axial slice in viewer. /// Displays the axial slice in viewer. WpfMprImageTool ? used for visualization and transformation of DICOM MPR slices in WinForms image viewer. WpfDicomViewerTool ? used for scaling of DICOM MPR slices in WinForms image viewer and for applying of VOI LUT to the DICOM MPR slice. WpfImageMeasureTool ? used for measuring of objects on DICOM MPR slice in image viewer. WpfTextOverlayTool ? used for displaying of text (metadata) on DICOM MPR slice in image viewer. Here is an example that demonstrates how to display a coronal DICOM MPR slice with metadata in image viewer.
''' Displays the coronal slice with metadata in viewer. /// Displays the coronal slice with metadata in viewer. WpfMprVisualizationController class allows to control the visualization of several DICOM MPR slices in several WinForms image viewers. For example, it is possible to use 3 image viewers for simultaneous visualization of sagittal, coronal and axial slices of examined object. Or for example, it is possible to use 2 image viewers for simultaneous visualization of sagittal slice and curvilinear slice, which was build on base of the sagittal slice. Call the constructor of WpfMprVisualizationController class to define the DICOM MPR image and specify N image viewers necessary to visualize DICOM MPR slices. Call WpfMprVisualizationController.AddThreeSlicesVisualization or WpfMprVisualizationController.AddSliceVisualization or WpfMprVisualizationController.AddSlicesGroupVisualization method to define the parameters of DICOM MPR slices necessary to display. Call WpfMprVisualizationController.ShowSliceInViewer method for each image viewer and specify which DICOM MPR slice is necessary to display in each image viewer. Here is an example that demonstrates how to display coronal, sagittal and axial DICOM MPR planar slices in 3 image viewers.
''' Displays the coronal, sagittal and axial DICOM MPR slices in 3 image viewers. /// Displays the coronal, sagittal and axial DICOM MPR slices in 3 image viewers. Here is an example that demonstrates how to display an axial DICOM MPR slice in the first image viewer and build and display the curvlinear DICOM MPR slice, which is based on axial slice, in the second image viewer.
''' 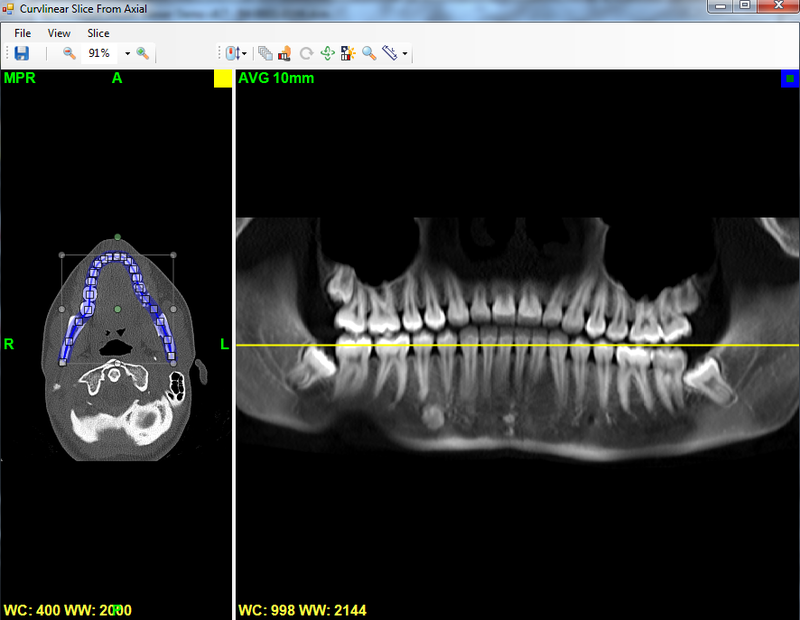 builds and displays the curvlinear DICOM MPR slice, which is based on axial slice, in the second image viewer. /// builds and displays the curvlinear DICOM MPR slice, which is based on axial slice, in the second image viewer.